Maldives: The last cruise frontier? The islands in the Indian Ocean are so remote that Fain felt like he could get away from everything by going there. Indeed, the Indian Ocean may be the most out-of-the-way cruise destination you’d ever want to experience. With the rise in expedition cruises to the Antarctic, the Indian Ocean may be the last frontier. Among the lines going to the Maldives are Costa Cruises, Oceania Cruises, Princess Cruises and Seabourn Cruises. What is there to do there? “Absolutely nothing,” Fain said. Most of these lines visit the Maldives on an itinerary from southern or eastern Africa to India or Southeast Asia. It is a long, thin route that involves lots of sea days, a long flight from North America — unless you’re on a world cruise — and a considerable expense. Seabourn’s cruise next January sandwiches a visit to Male and Colombo, Sri Lanka, in the middle of eight long sea days on a voyage between South Africa and Singapore. Princess has a 46-day journey on its schedule that takes visitors to the Maldives on an “odyssey” from Australia to South Africa. Oceania Cruises plans to be there Dec. 3 and 4 on a 30-day cruise from Dubai to Cape Town, South Africa. In the next few years Silversea Cruises has four voyages with the Maldives on the itinerary, including a 17-day trip between Singapore and Mombasa, Kenya, next March. In 2016, Silversea’s new expedition ship, the Silver Discoverer, will offer a 17-night cruise that starts in Phuket, Thailand and ends in Male, after stops in Myanmar, India’s Andaman Islands and Yala National Park in Sri Lanka. created specially for the show. Starwater tells a visual story with groundbreaking technology and live performance artistry. Vistarama transforms the sea view of Two70º into any scene — real or imagined. Royal Caribbean Productions created Sonic Odyssey with the help of musical innovator and performance artist William Close. Being at the forefront of entertainment comes naturally to Royal Caribbean International®. Through the years, the company has pushed beyond the main stage to introduce new ways for ships to entertain — on the ice, in the water, and in the air. And now with the introduction of Quantum of the SeasSM, Royal Caribbean will transcend the idea of entertainment altogether. “Royal Caribbean doesn’t see barriers. If we see something on land, we bring it to the sea. But Quantum of the Seas is different — we’re creating things from scratch. It’s completely unique,” said Nick Weir, Vice President of Entertainment. Quantum of the Seas’ entertainment lineup introduces a few things the world has never seen before — like dancing robots, new musical instruments, and a space that can change to any scene in the world. Two70° is considered the “great room” of Quantum Class. By day, it is a bright and welcoming lounge where guests can enjoy the beautiful sea views through oversized windows that span three decks. By night, the space can be transformed in minutes into something completely different. One of the main attractions in Two70°, Vistarama uses the windows as a digital canvas, creating an entirely new scene — outer space, deep sea, forests and almost anything else you can imagine — through video mapping and powerful projectors. Over 100 feet wide and 20 feet tall, and at a stunning 12K resolution, the picture quality exceeds even the highest resolution movie screens. The headlining show featuring Vistarama technology is Starwater, the story of a muse, Celestia, who brings together the magic of the stars and the mysteries of the seas. An awe-inspiring visual and theatrical spectacle, Starwater shows the combined emotional power of digital mapping, special effects, and Royal Caribbean’s own talented performers. Another unique Two70° innovation is the Roboshow, a troupe of six Roboscreens that stage surprise performances throughout the cruise. Each screen measures over seven feet high and is controlled by powerful robotic arms. Though the Roboscreens are huge, the power behind them makes the screens delightfully nimble as they interact in a series of short vignettes. Royal Caribbean also explores new frontiers in global sound with Sonic Odyssey, a show developed by the team in collaboration with innovator and performance artist William Close. The production includes his one-of-a-kind instruments, like his signature Earth Harp whose strings will extend over the audience, all the way to the back of the Royal Theater; a unique Drum Wall consisting of 136 drums; a Violin Dress and more. These weave together with a nine-piece live orchestra and a cast of singers, dancers, aerialists and gymnasts. Even the parties on Quantum of the Seas will incorporate technology, themes, and interactivity in a way that’s never been done before. Quantum of the Seas will not only introduce the hit Broadway musical Mamma Mia! at sea, but also the Mamma Mia! After Party where guests can walk a red carpet to meet the show’s stars before dancing and jiving into the late night. Other new parties will use the unique qualities of Quantum’s new space to create an immersive atmosphere — like Gatsby in Two70°, where digital technology will transport guests to the Roaring Twenties. And in the intimate Music Hall, a new late-night party called Wink is infused with class and sass as Royal Caribbean’s performers entertain an adults-only crowd. The number of cruise passengers sourced from the U.S. isn’t growing as fast as it once was, leaving U.S. travel agents with a market that may contract if trends continue. Figures from the 2014 Economic Impact study recently released by CLIA show that growth has declined in each of the past four years. While the absolute number of U.S. passengers has grown since 2010, from 10.1 million to 10.7 million last year, the relative share sourced from the U.S. has dropped from 68% to 61%. Growth was a barely positive 0.3% in 2013, following increases of 2.2% in 2012, 3.5% in 2011 and 6.2% in 2010. 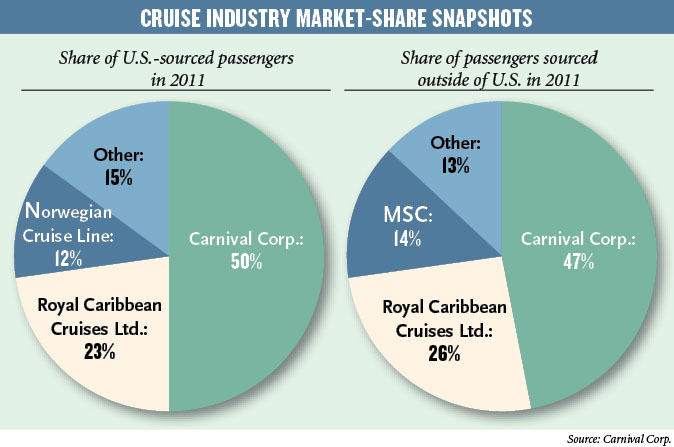 Separately, the number of passengers embarking on a cruise at a U.S. port last year fell 1.3%. What accounts for the slowdown? Andrew Moody, one of the authors of the study and president of Business Research and Economic Advisors of Exton, Pa., cited several factors that could be diminishing growth in the U.S.
One is that cruise lines have put the brakes on ship construction in recent years, to try to allow prices to rise. That has slowed growth in the supply of cabins available for sale. At the same time, the industry has been devoting ships both new and old to distant markets and has increased its capacity to sell cruises on those ships in Europe, Asia and elsewhere. The Carnival Spirit and Royal Caribbean International’s Rhapsody of the Seas are among the ships operated by North American lines that have been shifted full time to Australia in recent years, helping to make it the fastest-growing cruise market. In contrast to the Australian economy, which never really lost its footing, the U.S. economy has been in recovery mode since 2008, Moody said, another factor slowing growth. 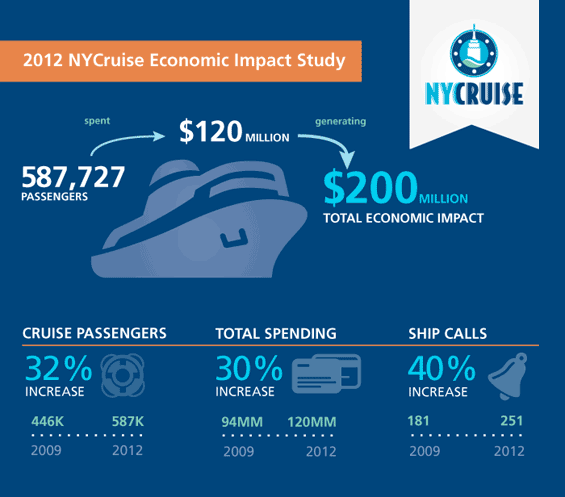 And while the U.S. economy is on the rebound this year, growth in the cruise sector has been uneven. That shows up in the count of passengers embarking from a U.S. port, which fell in 2013 to less than 10 million, vs. nearly 10.1 million in 2012. The number of passengers sourced from the U.S. includes residents who went abroad to catch their cruise, be it to Barcelona or Vancouver. The number embarking from U.S. ports could include foreign customers who fly to the U.S. to board a cruise but is mostly Americans. That 1.3% decline Moody attributed mainly to a slump in the Western states. On the East Coast, Florida ports are holding their own, and New York has seen an increase in embarkations, Moody said. “The California declines offset a lot of the growth elsewhere in the country,” he said. In a separate study of the impact of the cruise industry on the global economy, Business Research and Economic Advisors said the top 10 sources of cruise passengers worldwide, in descending order, were the U.S., U.K., Germany, Italy, Australia, Canada, Brazil, China, France and Spain. Beyond the slowdown in U.S. passenger growth, the impact study estimated that for the first time, direct spending by North American cruise lines, passengers and crew in the U.S. topped $20 billion. The global study pegged direct spending by cruise lines, passengers and crew worldwide at $52.3 billion last year.